Local collision avoidance algorithms in crowd simulation often ignore agents beyond a neighborhood of a certain size. This cutoff can result in sharp changes in trajectory when large groups of agents enter or exit these neighborhoods. In this work, we exploit the insight that exact collision avoidance is not necessary between agents at such large distances, and propose a novel algorithm for extending existing collision avoidance algorithms to perform approximate, long-range collision avoidance. Our formulation performs long-range collision avoidance for distant agent groups to efficiently compute trajectories that are smoother than those obtained with state-of-the-art techniques and at faster rates. Comparison to real-world crowds demonstrates that crowds simulated with our algorithm exhibit an improved speed sensitivity to density similar to human crowds. Another issue often sidestepped in existing work is that discrete and continuum collision avoidance algorithms have different regions of applicability. 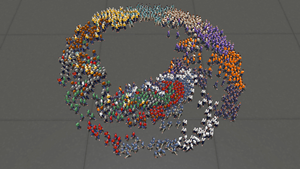 For example, low-density crowds cannot be modeled as a continuum, while high-density crowds can be expensive to model using discrete methods. 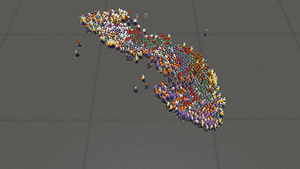 We formulate a hybrid technique for crowd simulation which can accurately and efficiently simulate crowds at any density with seamless transitions between continuum and discrete representations. Our approach blends results from continuum and discrete algorithms, based on local density and velocity variance. In addition to being robust across a variety of group scenarios, it is also highly efficient, running at interactive rates for thousands of agents on portable systems. Abhinav Golas, Rahul Narain, Sean Curtis, and Ming C. Lin, 2014. 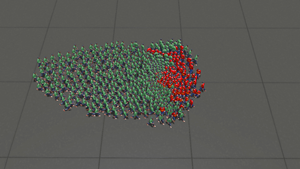 Hybrid Long-Range Collision Avoidance for Crowd Simulation. In IEEE Transactions on Visualization and Computer Graphics, July 2014 (vol. 20 no. 7) pp. 1022-1034. Abhinav Golas, Rahul Narain, and Ming C. Lin, 2013. 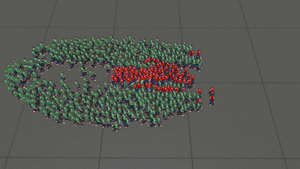 Hybrid Long-Range Collision Avoidance for Crowd Simulation. In ACM SIGGRAPH Symposium on Interactive 3D Graphics and Games (I3D) 2013.